So at last it appears that summer has arrived and with this beautiful weather it brings a different set of obstacles to overcome. This week’s challenge has involved Precious the pig. She’s the pig that we bought for the hog roast at Evie and Joe’s recent wedding, but got a reprieve. The thing is that like all of the animals they are going through gallons of water each day, with it being so warm and that’s where the problem begins. For some reason, Precious has got into a bit of a game with the water trough. Whenever it gets filled up, which is very regularly in this weather, she sticks her nose, which is the size of a shovel, underneath it and tips the whole thing over, leaving it empty and needing to be refilled. 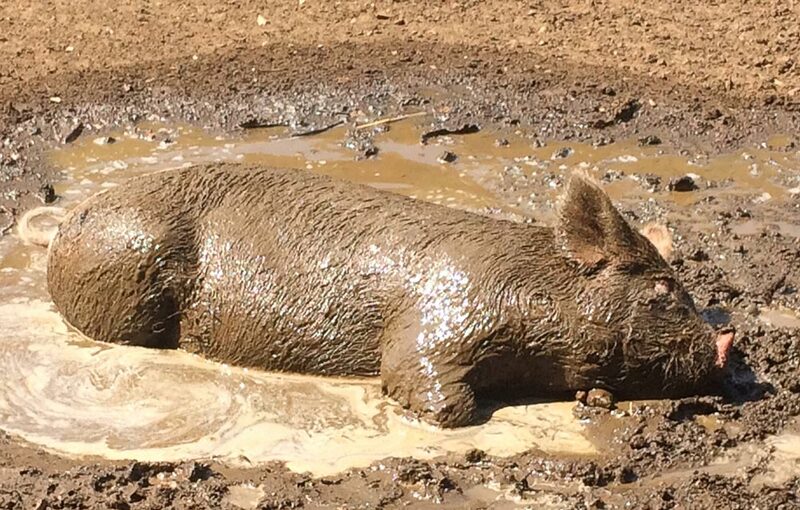 How do I tell a 100 kilo pig, please, don’t keep turning the trough over? I have tried everything I can think of to resolve the situation. I have changed the position around the field, wedging it up against the fence, making it more difficult to tip up, but to no avail. I have let her drink from it, allowing her to get her fill and then chased her away so the others can get a drink in peace, but she just meanders straight back and tips it up. I have tried weighing it down with blocks, to discourage her, but that hasn’t worked either. Initially it may have been that she started to tip it up so that she could drench the area thus turning it into a mud bath for her to lay out in the sun, but I think it’s just become a bit of a habit now. My concern is, that I obviously don’t want her or our other pigs to become dehydrated as a result of her actions, so any suggestions you may have to get around this problem would be very welcome! This week we had our first paying guests come and stay in our shepherd hut. We were very keen to make sure all was perfect for them even down to Wendy getting me to put hot water bottles in the bed, ahead of their arrival. “Why?” I asked. “It’s the middle of summer!”, but apparently it’s all part of the Ginger Cow service. Things had been going so well, until their last night with us, that’s when at 2am our new alarm started sounding. I flew out of bed and was there in a flash. I had it turned off in seconds and checked that all was well, before going back to bed. It later transpired that there had been a power cut, which had in fact set the alarm off. It was then on our minds for the rest of the night that the alarm had woken our guests. You can cope with owls hooting, cows mooing and hens clucking out here in the sticks but a racket like our alarm would wake anyone from their slumber. Well, that’s what we thought, but in fact we were wrong, they had a great night’s sleep, not hearing a thing. I just thought that I would mention: don’t llamas have such beautiful eyes? I know that all of our residents have lovely eyes, but my goodness, when you look into a llama’s eyes, being so large and absolutely crystal clear, with eyelashes that seem to go on forever, it’s a whole different experience.